A magnitude (M) 5.2 earthquake struck rural southeastern Arizona near Duncan, Arizona, on the New Mexico border just before 10 p.m. Saturday night. The U.S. Geological Survey’s online tool “Did you feel it” received more than 2,300 “felt” responses, some from as far west as Phoenix and as far east as Alamogordo, New Mexico. Residents near Duncan and surrounding communities reported moderate shaking. There are no reports of injuries or significant damages. Preliminary analysis of earthquake data from the Arizona Integrated Seismic Network operated by the Arizona Geological Survey (AZGS) indicates about a dozen earthquake events, including a probable foreshock of approximately 3.0M at 5:57 p.m. on June 28. The main 5.2M event was followed by at least 9 aftershocks, four of magnitude 3.0 or greater (attached map). The first aftershock, a 3.5M event occurred at 10:22 p.m. on June 28, a 3.4M aftershock occurred at 1:29 a.m. on June 29th, and a third 3.6M at 7:33 a.m. on June 29th. The latest measurable event, 3.3M occurred at 8:40 a.m. on June 29th. Many smaller aftershocks undoubtedly occurred but have not been detectable by our seismometers. The earthquakes make a NW-SE trend extending for about 5 miles. All events were shallow, occurring less than 6-miles deep. Historical seismicity in this area, including the recent events, as well as the mapped Quaternary faults, can be viewed at the online interactive Natural Hazards in Arizona Viewer on the AZGS website [http://data.usgin.org/hazard-viewer/]. The largest historical earthquake in the southeastern Arizona – southwestern New Mexico – northern Mexico region was the M~ 7.5M event in May 1887 on the Pitaycachi fault of northern Sonora, Mexico, about 25 miles south of Douglas, Arizona. This is considered the largest earthquake likely to occur in this region. A M5.5 earthquake occurred on August 17, 1938, near Buckhorn New Mexico, and M4.5 events occurred soon after in the Duncan and Clifton areas. In May 2010 and October 2012, small earthquake swarms, with earthquake events ranging from M2.0 to M4.1, occurred about 45 miles north-northeast of Duncan, in the Morenci-Clifton area of northern Greenlee County. According to US Geological Survey probability models, the likelihood of a substantial M5.0+ earthquake within 31 miles of Clifton-Morenci area over the next 25 years is ~20%. It is likely that small magnitude aftershocks will continue in the Duncan area for days or weeks. Most will probably go unfelt. A larger magnitude event could still occur. In the event of severe ground shaking, residents are advised to “Drop, Cover and Hold on”. 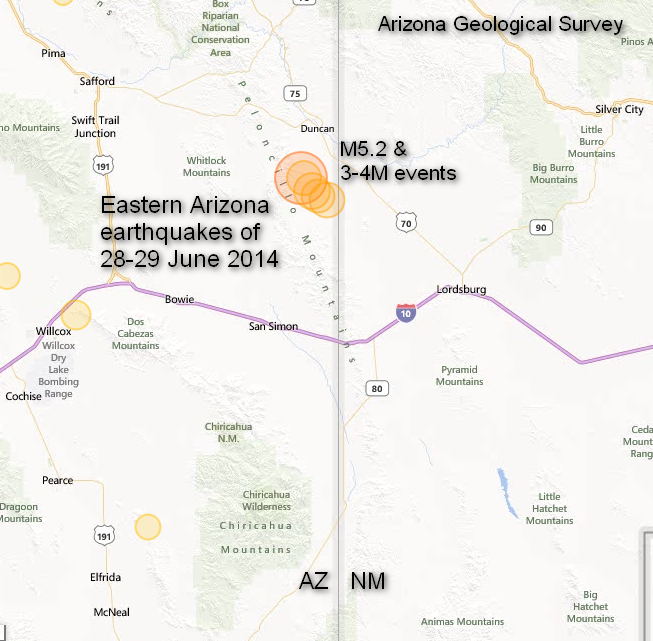 · Earthquakes in Arizona 1852-2011 – Time lapse video showing locations and magnitudes of earthquake events in Arizona. Length: 90 seconds. · Arizona is Earthquake Country – Forty-four page primer on earthquakes, earthquake hazards and mitigation in Arizona. · Great Arizona ShakeOut – Online earthquake preparedness information and drill.